Roland has released Go:Piano – an affordable, compact and lightweight electric piano and midi controller. It is part of the Roland’s Go Series of entry level products, and it’s perfect for musicians, music students, performers and producers. Go:Piano has 61 ivory-feel, box-shaped keys that can be as heavy as a piano keyboard, so that the user can have a full piano experience. 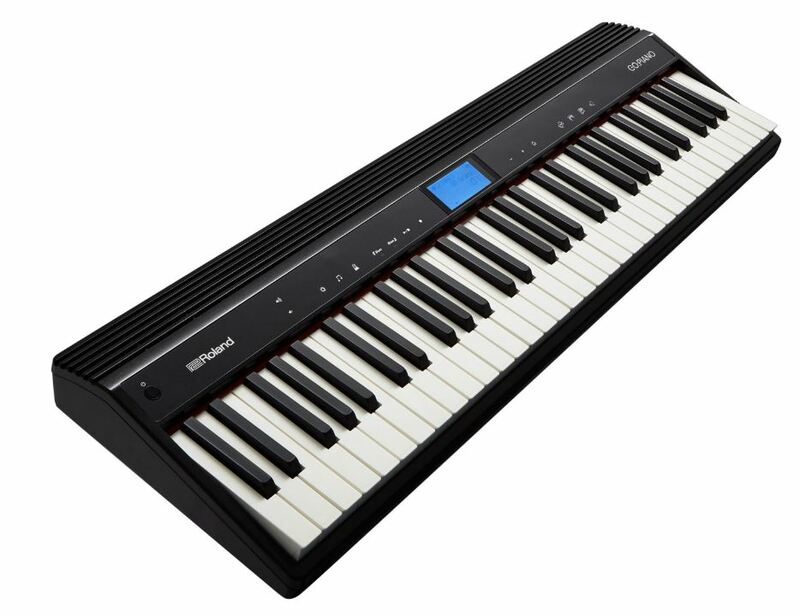 The instrument comes with 10 acoustic piano patches, 7 electric pianos, 7 organs, and 16 various patches, including SFX and a drum kit. It also comes with an Effects section, with chorus and reverb included. The keys are velocity and touch-sensitive, with 3 types of sensitivity. Since it is an equipment designed for piano practice as well, it has a built-in metronome and even a built-in recorder, so that the user can save their performances for later review. It’s possible to connect Go:Piano to Android or iOS mobile device via Bluetooth 4.2 technology. It’s also possible to connect the unit to a computer and turn it into a midi controller. The instrument panel has several control buttons, such as volume up and down to adjust the overall volume. It has controls for Settings, Metronome, Octave Up and Down, Patch Select, as well as recording and even a Song Playback, with 15 pre-recorded renowned music pieces. The back panel has a USB port for computer connection, a power supply connector, a sustain pedal input, a phones/output jack, and an aux input so that the user can connect the unit to an audio player.